Virtual Office VA Staffing is a work-at-home company that hires virtual assistants to work as independent contractors. The company is relatively new making it hard to find a lot of information on. However, it has been in business for almost two years. The company is owned by Elsa Oden. Virtual Office VA Staffing’s clientele are private real estate investors, who are searching for individuals wishing to sell their homes. These are home sellers who have already listed their homes on major real estate web sites and are hoping to hear from a potential buyer. What do virtual assistants who work for Virtual Office VA Staffing do? When you accept a position at Virtual Office VA Staffing, you will be calling potential home sellers on behalf of the real estate investor. You will be given a list of online questions that you are to ask the seller, and you will then type in the answers. Based on the information that you provide, the real estate investor will try to put together a deal and call the seller back. While you are not “selling” you are generating leads and are expected to meet a minimum quota per hour of 2 to 3 good leads. Your main source of lead tracking will be three main web sites, which you’ll learn in training. If you enjoy research, lead generating, and have a passion for real estate this might be a good work-at-home position for you. You will not be calling foreclosed properties. What are the equipment requirements for Virtual Office VA Staffing? You will need High-speed Internet and either Windows 7, Windows XP or Windows Vista. You have your choice of using your own home land line or even your cell phone, but those charges are not covered by Virtual Office VA Staffing. You will need noise canceling headsets for your phone. You can also use Skype, which is a plus for most workers. Either a PC or laptop is fine. Hardwired or wireless is accepted as long as not too many calls are dropped. You will also need to set up Google Voice, so that when callers can call you back they will not end up on your answering machine. If you see the designated area code in your LCD panel, don’t answer. It will get transferred back to Virtual Office VA Staffing, and they will forward it to your Google Voice. Virtual Office VA Staffing will show you how to set up your Google Voice. You don’t want to have background noise. You will need an area of the house where you can close the door and work uninterrupted. No prior real estate experience is necessary. What is the workday like at Virtual Office VA Staffing? You will need to log into the schedule first thing. Even if you are not working that day, someone may need you to work if you are available. If you go more than two days without checking in or not showing up to work when scheduled, you may lose your contract. Not only will you lose your contract, but you will also forfeit any money up to that time. You will then begin your work of searching for leads, calling leads, logging leads, following up on leads, and then recording what you have done. Ideally, it should not take you more than 10 minutes to find a lead. If you are taking more than 10 minutes, you need to contact your assigned mentor or one of the other leaders for help. When calling potential home sellers, you will pull up a script, read the questions from the script and type in the answers. There will be questions such as how much is still owed on the house and is there a second mortgage on the home. This would not be a work-at-home job for someone who is not comfortable discussing money. What is the Schedule like at Virtual Office VA Staffing? The schedule is basically Monday through Friday from 8:00 a.m. to 8:00 p.m. EST. If you are a “night owl” and are used to working overnight this might not be for you. Obviously, even if sellers are anxious to sell their homes, they still may not be “3:00 a.m. anxious”. If a caller has stated that he or she doesn’t mind being called back on the weekend, you can work the weekend just to get caught up and make your lead quota. You are allowed to leave a message on their answering machine if they are not home or don’t have all of their information. Currently, there are no longer full-time hours, but you can work 15 to 20 hours a week. You can start with as few as 5 hours until you are comfortable working at least 15. What does Virtual Office VA Staffing pay? The pay averages between $8 to $9 an hour and is paid by the minute and tracked to the nearest 5-minute mark. Their philosophy is that if it’s trackable, it’s billable. Virtual Office VA Staffing has its definition of what is trackable. Logging duplicate leads is one example of a task that is not considered trackable, and therefore not considered billable. Be careful not to waste your time and not have it be untrackable. Training is unpaid time, and you are considered an independent contractor. What is the pay schedule at Virtual Office VA Staffing? The pay schedule is once a week via PayPal (one week behind). Obviously, if you don’t already have a PayPal account you will need to set one up. What is my overall impression of Virtual Office VA Staffing? After attending the orientation and training, I definitely don’t believe it is a scam. Overall, it seems like a favorable place to work given not everyone enjoys phone work. However, for me there were a few “undesirables” (not necessarily “red flags”)such as the types of questions asked and how much time would actually be spent on finding leads. I also wasn’t completely comfortable with their definition of “trackable” hours. I am also a night owl, and prefer working later. Also, the question about are virtual assistants allowed to ask these questions without a real estate license has come up several times. At orientation Elsa Oden, the owner, did explain that her VAs are only “fact finders” to the private investors. However, some potential VAs have contacted their real estate licensing office and were told that they do need to have real estate license and if not there is a fine of up to $1,000 per offense. There are still questions about this issue, which is probably better answered at the independent contractor’s state level. I have met a few VAs on WAHM.com and WorkPlaceLikeHome.com who are enjoying the calls and have good things to say about the company and people. They said the calls weren’t hard and the team leads were helpful and patient while they learned. However, like all WAHM jobs, I have also met those who were not comfortable calling home sellers and asking them for their social security number as well as how much they owed on their home. I will say also that you never know until you try. So, if you are willing to give this WAH job a try, please do. 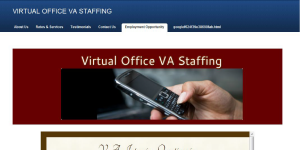 How do potential applicants apply to Virtual Office VA Staffing? If Virtual Office VA Staffing sounds like it could be a “fit” for you or one of your work-at-home colleagues, then send a resume to professionalva4hire@gmail.com. After sending your resume, you will still need to fill out the application at www.virtualofficeva.com. Click on the “Employment Opportunity”. Currently, they are offering between 15 to 20 hours a week, but it could increase. Good luck to those of you who apply! Still hearing back from different VAs working there. Overall, MOST (not all) are still liking it! Jess, phone work can be hard when you have little ones and can’t put the callers on hold or be interrupted. It’s always something you can put on your “back burner” for when they get older. Leisa this question came in on Facebook and I am hoping you can give a clear answer on it. Thanks! Can you login anytime between 8am-8pm to do your work? Or is it a fixed schedule? Thanks, Miranda. You can choose your hours between 8 a.m. to 8 p.m. as a fixed schedule (up to a week in advance) or you can check in to see if anyone needs coverage. My understanding was that if you have extra time and another agent has an emergency and needs coverage, you may be asked via email or Google Voice to pick up those hours. You CAN pick those up. So, basically you can chose your hours a week in advance, BUT check in daily to see if there may be additional hours begging for coverage. This is a great review, Leisa. Thanks for investing the time to sit through the call. Sure, Angie. I was almost tempted to sign up with this one! This is a good review, however I would like to clarify a few things to everyone. First of all, we do not ask for social security numbers or any personal information. The mortgage information that we ask is public record and we don’t need exact figures, only estimates of the payments and balance. Searching for leads is billable time, however if none can be found within 15 minutes, time stops and you would need to contact your mentor (SVR) to contact client to expand area. We should be averaging 1-3 leads per hour. If a VA is missing for more than 48 hours, pay is held until we hear from the VA, then pay will be released. Pay is $9-$10p/hr with no rounding of time. Due to the fact calls are made through Google Voice, it does not use your minutes on your phone. You do not set up a Google Voice, as this is already setup in the client account. A headset is not required. We are still hiring full time as well as part time VAs. Please do not email progessionalva4hire@gmail.com, as she is no longer with us. All resumes can be mailed to hr@virtualofficeva.com. Is this still a legitimate job? If so how do I get on with this company? Thank you, Elsa. I was secretly hoping someone would clarify all of this as I did attempt to sort it all out mostly through the help of the person “M” who was at progressionalva4hire@gmail.com. I had communication during and after training. As I stated, it still sounds like a good company worth looking into. I was almost tempted myself! How does someone know they have pass the Virtual Office test?